I am a fan of Liz Curtis Higgs' books because each one reminds me of why I love the Bible and the wealth of wisdom it contains. 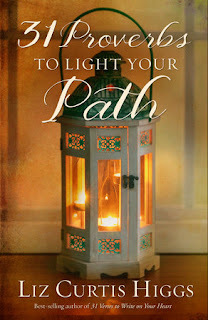 Which is why I was so excited to receive a copy of her latest book: 31 Proverbs to Light Your Path for review by Blogging for Books. As the title suggests, the book is broken into 31 short chapters, suitable for daily private devotions, or to incorporate into a weekly Bible study group. Each chapter focuses on one verse from the book of Proverbs and uses that verse to talk about broader issues in our lives from a Biblical perspective. When we think of the Book of Proverbs, we may find ourselves rolling our eyes and imagining a litany of Do's and Don'ts that have little relevance to our lives today. Liz counters this with a fresh perspective: "...the deeper truth [is] it contains wisdom. We'll discover why God calls us to righteousness and how He makes being good possible....My goal is not to show you how to be good. My goal is to show you how good God is." Liz uses several Bible translations to delve into literally each word of these short Bible verses to give us a rich and deep dive into God's message. Each chapter is ended with a short exercise you can do to apply the lesson of the proverb to you own life. I love Liz's companionable voice, when you read her books you feel as if you are listening to a wise friend who who wants to share what she's learned, not talk down to you. I highly recommend this book.